As the greatest clubs in Europe go head to head, you can ramp up the excitement from your mobile with the MansionBet Champions League Cup! For the chance to win up to £10,000 Cash and claim the bragging rights, place a YourBet of £1 or more on a UEFA Champions League group match and if YourBet comes in, you’ll be placed on the leaderboard. There are overall prizes worth £20,000 up for grabs, including weekly prizes worth £1,000 to be won every Champions League match week. To create YourBet, head to the match of your choice on your mobile, tap ‘Toggle ON to create YourBet’ and then choose up to 6 selections such as Match Winner, Total Goals, Corners and Bookings. YourBet odds will be automatically calculated and shown at the bottom of the screen. Prizes (cash prizes and Free Bets) available for overall Top 20 highest winning YourBet odds, and Top 10 weekly highest winning YourBet odds. Ongoing leaderboard will show who is in line for the overall top prizes and the weekly prizes. Free Bet terms apply to Free Bet prizes. 1. Promotion is valid from 17/09/18 and will end on 12/12/18 (00:00 GMT) and is open to anyone age 18 years or over who is a registered member of MansionBet.com. 2. 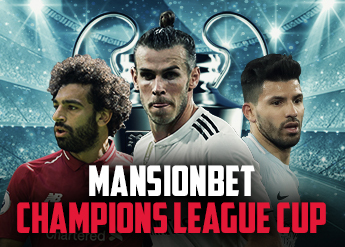 Participate by making a qualifying bet, which is a ‘real money’ stake of at least £1 using MansionBet’s ‘YourBet’ feature on the UEFA Champions League Group Stage 2018. Each Yourbet must consist of at least three (3) selections to be eligible. 3. YourBet is available for pre-match football markets only on mobile devices. Upon entering an event, participants are required to ‘Toggle ON and Create YourBet’ to enable the feature. 1. YourBet can be placed as a single bet only and cannot be combined with other markets. 2. YourBet may not be the subject of Cash Out, Partial Cash Out or Edit My Bet. 4. YourBet may by placed using a combination of real money and/or bonus funds from your Sports balance. 5. Unless explicitly stated otherwise, YourBet shall not contribute toward the eligibility requirements for a promotion and shall not contribute to the rollover requirements of any promotion. 6. The maximum number of selections which can be included in a YourBet is 6. 7. If a selection within YourBet is void or cancelled, the entirety of the YourBet will be void. 8. MansionBet provides no guarantee that the YourBet facility will be available for a specific market or Customer. MansionBet reserves the right, at its sole discretion, to disable the YourBet facility at any time. 1. By participating in the promotion, you consent to MansionBet displaying participants usernames on the promotional leaderboard. 2. Usernames will be partially obscured to safeguard participant personal data privacy in the following way: example, username is “BILL2999” and would be displayed on the leaderboard as “BI****99”. Should a participant wish for his username to be completely anonymised, he or she may contact customer support at any time to notify this and MansionBet will promptly comply. 3. Each qualifying YourBet is eligible to be displayed on 2 separate Leaderboards: Weekly Matchday Leaderboard and the Overall Leaderboard. 4. The Overall Leaderboard will display 20 positions from 1 to 20, in descending order starting with the biggest winning odds YourBet selection at the top, showing the odds of the win and also the username. 5. The Matchday Leaderboard will display 10 positions from 1 to 10, in descending order starting with the biggest winning odds YourBet selection at the top, showing the odds of the win and also the username. The Matchday Leaderboard will be updated per Matchday round. 6. Only one (1) winning YourBet selection with the highest odds will be displayed on each leaderboard per customer. Eligible participants will be displayed on the leaderboard at the end of each Matchday (18-19 Sep, 2-3 Oct, 23-24 Oct, 6-7 Nov, 27-28 Nov, 11-12 Dec) for the Matchday Leaderboard, and at the end of the UEFA Champions League 2018 Group Stage for the Overall Leaderboard. 7. The leaderboard will be updated instantaneously. Please allow 24 hours in case of extenuating circumstances. 8. In the event of manifest error in the displaying of the leaderboard or unavailability of the leaderboard due to technical issues, MansionBet reserves the right to temporarily withdraw the leaderboard. 1. Only player accounts that are open and verified (in terms of both age and identity) at the conclusion of the promotional period will be eligible to win prizes. 2. Players who self-exclude during the promotional period will not be eligible to win prizes and will be removed from the leaderboard in the case that they are ranked on the leaderboard, at the time of the self-exclusion. 3. Customers holding multiple accounts, including accounts that are linked by device, household or IP address, will not be eligible to participate in this promotion and MansionBet reserves the right to remove from participation any participant found to be attempting to use multiple accounts. 5. Customers placing bets on the same market covering more than one outcome to guarantee a return will be excluded from the promotion. Such activity is deemed non-recreational. If we identify such behaviour, participants will be removed from the leaderboard and any prizes will be forfeited. 6. Only YourBets of £1 or above (or currency equivalent), on the UEFA Champions League Group Stage 2018 will count for this promotion. 7. This promotion starts on 17/9/18 and will end on 12/12/18 (00:00 GMT). 1. One (1) Free Bet token is available per offer per player. 2. Free Bet stakes are not included in any returns. 3. Free Bet must be used in its entirety – they cannot be placed on a succession of smaller bets. 4. Each Free Bet expires within 7 days of email receipt. 5. The maximum return from a Free Bet stake is capped at £5,000. 7. MansionBet reserves the right to withhold or retract any Free Bets and winnings generated if Free Bet tokens are mistakenly credited or patterns of abuse are found. 8. MansionBet reserves the right to exclude customers at any point during the promotion. 9. MansionBet’s decision is final and is not open to review or appeal by any entrant or third party. 10. This offer is intended for recreational players only and MansionBet may limit the eligibility of customers to participate in any promotion. 13. This promotion is open only to MansionBet players from the UK. 3. YourBet is available for pre-match or In-Play football markets only on mobile devices. Upon entering an event, participants are required to ‘Toggle ON and Create YourBet’ to enable the feature.